Welcome back to Gluten Free Philly for what promises to be an exciting year ahead. I hope everyone enjoyed their holiday and New Year's Eve celebrations. If you're just getting back to the grind from some down time, you may have missed some recent posts. In my final one for 2011, I recapped the last year's worth of features and news as chronicled at this page. Earlier this week, I reviewed Katz's new gluten-free donuts, which include jelly- and vanilla custard-filled varieties. One housekeeping note: By popular demand I have revived the map of gluten-free-friendly Philadelphia restaurants, the link for which is posted at the blog's Restaurants page. Before heading to Sweet Freedom Bakery for some gluten-free sweets, you can get your main course a block away at The QUICK FIXX (1511 South St., 267-273-1066). This new restaurant, which offers take-out and sit-down service, can prepare made-to-order dishes with gluten-free ravioli, spaghetti or penne. Rendez-vous is a crêperie in Haddon Heights (531 Station Ave., 856-546-4611) offering savory gluten-free crepes made with buckwheat flour. Thanks to reader Debbie M. for the news that Ruby's Diner - with area spots in Ardmore (5 Coulter Ave., 610-896-7829), Glen Mills (919 Baltimore Pike, 610-358-1983) and King of Prussia (160 N. Gulph Rd., 610-337-7829) - has Udi's gluten-free buns for its beef and turkey burgers. All menu items except for the fish tacos at Guapos Tacos, the roving Mexican food truck from Jose Garces, are gluten free. You can follow the truck on Twitter to see its daily location. The recently opened Sang Kee Noodle Cafe in Cherry Hill (1601 N. Kings Hwy., 856-310-2388) keeps soy sauce on hand to prepare gluten-free dishes. In addition to gluten-free pizza, Seasons Pizza's New Jersey outlets in Cherry Hill (450 Route 70, 856-428-4441) and Stratford (1014 N. White Horse Pike, 856-783-9333) now serve eggplant parmigiana, chicken parmigiana, lasagna and calzones. Iron Hill Brewery's newest location in the Chestnut Hill section of Philadelphia (8400 Germantown Ave., 215-948-5600) just opened, while Ted's Montana Grill's spot on Broad Street in Center City has shut its doors. Also closed is gluten-free friendly BYO Manna, down the shore in Margate. Hat tip to Renee B. for the info. Adriana Z. dropped me a line to let me know about two area markets stocking gluten-free groceries: Food & Friends Market near Rittenhouse Square (1933 Spruce St., 215-545-1722) - which carries Tate's gluten-free chocolate chip cookies, among other items - and Princeton's Whole Earth Center (360 Nassau St., 609-924-7429). 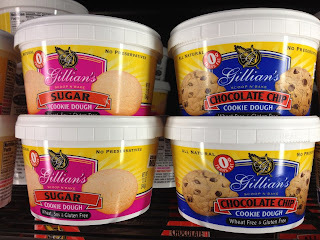 New at Wegmans markets are frozen sugar cookie and chocolate chip cookie dough, frosted occasion cakes, and blueberry, pumpkin and apple pies from Gillian's Foods. Golden Platter Foods' new GFCO-certified, all-natural chicken tenders, nuggets and patties are on sale this month at Acme markets. Thanks to Lena M. for the news. The Gluten-Free in Delaware County Meetup group will have lunch at Uno Chicago Grill in Newtown Square this Sunday at 2 p.m. You can RSVP for the event at this page. The NJY camps are offering a Gluten-Free Family Camping Weekend June 1-3 in the Poconos, in partnership with the Celiac Disease Center at Columbia University. It's an opportunity for a family getaway with a private cabin, including pools, lakes, ropes courses, art workshops, family entertainment, kosher gluten-free meals from a dedicated kitchen, day camp for kids, and programming for adults. It's $250 per adults, with kids under 18 free, and is open to families of all religions.